St. Martin's Press, 9781250098672, 336pp. 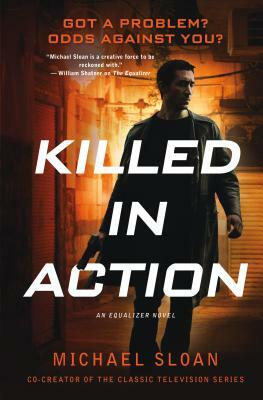 Creator of The Equalizer TV series--the basis for the feature films starring Denzel Washington--Michael Sloan reinvents the story of the mysterious Robert McCall, a former intelligence officer who helps desperate people in need of his unique skill set. Got a problem? Odds against you? Call the Equalizer. McCall’s first client is a distraught mother who is desperate to locate her young daughter, drawn into the shadowy world of white slavery. But this client may not be all she appears to be. At the time same, McCall is approached by a diplomat who works for the United Nations. Her son, an American Captain in the US Army, is part of a contingent advising Syrian Rebel forces in their fight against the Jihadists. He has been reported KIA, but his body has not been found. His mother asks McCall to find out if her son is alive or dead. When McCall embarks on a suicidal rescue mission in Syria, he stumbles upon a terror plot aimed at the United States. The terrorists are being protected by mercenaries known as Momento Miro—Remember That You Must Die. McCall discovers the key to the terror attacks is his one-time boss, Control, the head of a spy organization called “The Company.” He is missing. His life has been deleted from all personal and intelligence records, as if he never existed. McCall has to find his old friend and stop these terror attacks from being carried out on American soil. McCall also has to deal with an “Equalizer” wannabe, a psychotic vigilante whose attempts to be a “hero” and rid the New York streets of violent crime are getting innocent people killed. MICHAEL SLOAN has been a show runner on such TV series as Alfred Hitchcock Presents, Kung Fu: The Legend Continues and Outer Limits. He has also written and produced numerous TV Movies and features. He created the series The Equalizer for Universal TV and CBS and is currently producing a feature version of The Equalizer for Sony Pictures starring Denzel Washington in the title role. Michael is married to actress Melissa Anderson and they have two children, Piper and Griffin.